Who says you have to go the gym to get a good work out? Rubberbanditz is a full body fitness solution that fits neatly in a bag for on-the-go convenience and easy at-home use, anytime, anywhere. No big, bulky equipment necessary. No monthly gym membership fees required. With its unique circular design and detatchable grips and straps, Rubberbanditz lets you simultaneously strengthen your core as well as your upper and lower body instead of just isolating one muscle at a time. Rubberbanditz was designed by Ari Zandman-Zeman, a former Division I basketball player who was without access to a gym during his time in the Peace Corps. But this training system is not just intended for fitness gurus. Rubberbanditz comes with a workout book and dvd featuring 150 different workouts for everyone from beginners to the most advanced athletes. Unlike other bands, Rubberbanditz are uniquely constructed using a continuous layering process to prevent breakage and increase durability. Each band can stretch up to 2 ½ times the original length, delivering a wide range of tension levels. Located in Durham, North Carolina, Ari has built his company on what he calls a “get fit, give back policy” working with global non-profits to promote health and create jobs to make the world a stronger happier place. More bang for your buck with a full-body workout and a good cause, now that’s an exercise routine worth smiling about. Who says you have to go the gym to get a good work out? Rubberbanditz is a full body fitness solution that fits neatly in a bag for on-the-go convenience and easy at-home use, anytime, anywhere. No big, bulky equipment necessary. No monthly gym membership fees required. 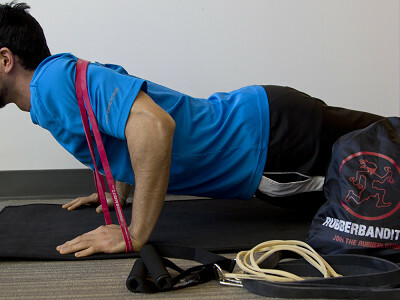 With its unique circular design and detatchable grips and straps, Rubberbanditz lets you simultaneously strengthen your core as well as your upper and lower body instead of just isolating one muscle at a time. Rubberbanditz was designed by Ari Zandman-Zeman, a former Division I basketball player who was without access to a gym during his time in the Peace Corps. But this training system is not just intended for fitness gurus. Rubberbanditz comes with a workout book and dvd featuring 150 different workouts for everyone from beginners to the most advanced athletes. Unlike other bands, Rubberbanditz are uniquely constructed using a continuous layering process to prevent breakage and increase durability. Each band can stretch up to 2 ½ times the original length, delivering a wide range of tension levels.